Dancing is a big part of Colombian culture and salsa has a privileged spot in the Colombian dance scene. Most of us grew up dancing salsa at family parties, birthdays and so on. So, if you’re in town or are planning to visit, salsa should be on your to-do list. We’ve teamed up with our friends from Salsa Classes Medellin to put together a comprehensive list of 10 of the very best spots for salsa dancing in Medellin, enjoy. This is hands down the best area for Medellin newbies and the reason for it is quite simple: it is safe, has overall great nightlife (especially around Parque Lleras and Provenza) and the most varied types of restaurants in the city. Most of the best salsa bars in Medellin are located in this area which makes it super easy for bar hopping. This is one of our preferred spots for salsa in Medellin because, in spite of being in a quite touristy area, there is still a local feeling to it. Music varies between Salsa Vieja Guardia (a.k.a. salsa classics) and more modern songs. The dancefloor is quite small; however, you’ll see a lot of people dancing there. It also has a nice balcony for whenever you need a break from all that salsa dancing. On top of that, there’s a terrace where they play mostly reggaeton and some electronic music, in case you want to switch things up a bit. This one is only a couple of blocks up the hill from Buena Vista. The set up is similar to that of a typical Colombian tienda (a small store that sells a bit of everything) but at a much bigger scale. This is the perfect spot if you want to chill with friends, have some typical Colombian food, listen to amazing salsa music and sip on a beer or two or maybe some guaro, the icon of Medellin’s liquor, why not? This spot isn’t for dancing, just for kicking back and listening to music. When: Opens every day 4 pm – 1 am. Busier Thu-Sat. This one is a restaurant-bar with a terrace set up. It was founded by a couple of Cuban immigrants and as such, it is inspired by Cuban culture. You’ll hear the most popular Cuban salsa songs and people mostly dance Cuban- style or Salsa Casino. They have a schedule of live performances, a kitchen specialized in Cuban dishes and excellent rum. This is a perfect place to chill with your friends or date, and have dinner and dance. When: Opens every day before midday for food until 2 am. On Fri-Sat-Sun it’s open until 4 am. Style: Salsa Casino, Colombian Salsa. SkyBar – Salsa in Medellin – Picture by Why Medellin? This is another great spot for salsa in Medellin, it’s located in the heart of Lleras Park and some of the most skillful dancers hang out here. They don’t only play salsa, you’ll hear a lot of bachata and kizomba as well as some reggaeton. They have free salsa classes on Thursdays and live performances are pretty regular. When: Weekdays until 2 am, weekends until 4 am. Style: Colombian Salsa, On1, On2, Casino, Bachata, Kizomba and Reggaeton. This one is not exactly in Poblado, but it’s close enough to walk to. (Approx 20 min from Poblado Park). This is one of my personal favorites. It is frequented mostly by locals and has a very chill vibe. People come here to dance, drink fabulous mojitos, rum and enjoy the live performances. They have many events scheduled on their facebook page that are worth checking out. This one isn’t exactly in Poblado either, it is mid-way between Poblado and Envigado under the Aguacatala bridge. It has a really nice indoor-outdoor setup and some of the best dancers in town love going to this place. This is definitely one of the most famous spots for Salsa in Medellin, and just like Skybar, the music varies between Salsa, Bachata, Kizomba, Porro, Merengue and Reggaeton. When: Thu – Fri – Sat until 2 am. Style: Colomian Salsa, On1, On2, Bachata, Kizomba, Porro, Merengue, Reggaeton, Champeta. This is another great area of Medellin. It’s very green and flat. Which is a relief after spending a while in Poblado. Poblado is charming but quite steep. It has many restaurants and bars, and the two most Iconic Salsa bars in Medellin are located there. This is also a personal favorite, a classic salsa bar that plays salsa music only. They have live salsa bands playing every weekend after 11 pm. The dancefloor there is very big, but gets crowded very easily. So I do recommend you to get there early if you want to get a good spot. Salsa dancing is the main attraction with Colombian Salsa and Salsa Casino being the most popular styles. Mostly locals hang out here so the dancing you’ll see is very relaxed, fluid, and natural. Style: Colombian Salsa, Salsa Casino. One of the most iconic spots for Salsa in Medellin, Tibiri is a bar located on La 70, the biggest party area in Laureles. 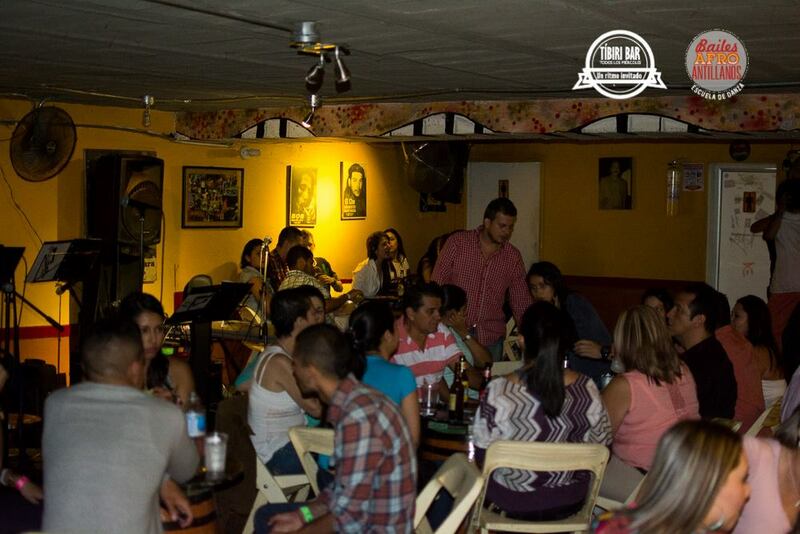 It is a medium-sized basement with a low ceiling (beware if you’re very tall), they play only salsa music and the songs are mostly Salsa Vieja Guardia (Classics). It is a great spot for dancing since everyone is very spontaneous. There’s a very casual feel to it. The place gets very crowded and there’s only a couple of windows, no AC. So, you’ll get sweaty, very, very sweaty, but it’s hands down one of the best spots to experience Colombian salsa nightlife. This is also one of the preferred areas for visitors and expats to stay. It is not actually Medellin, but the border between the two cities is so blurred that they have almost merged into one. There’s two great spots for salsa there. This is one of the most well-known places in Envigado for Salsa Vieja Guardia. A lot of the people that frequent this place go for the music, but you’ll also see a lot of dancing. The best thing is that since it isn’t as mainstream as the bars listed above, you’ll see only locals most of the time. When: Everyday except Sundays from 5 pm until 2 am. This bar is located in Guanteros, two blocks away from Envigado’s main park. Just like in Buena Vista in Poblado, this place doesn’t actually have a dancefloor, but that doesn’t stop us. They play salsa only, mostly popular songs and the newer stuff Whenever the place gets crowded, some people just take over the sidewalk. When: Sun – Mon – Tue – Wed from 6 pm until midnight. Thu until 2 am Fri – Sat until 4 am. So, this recommendation is for the most adventurous of you. Eslabón Prendido is by far the best spot for salsa in Medellin, for a couple of reasons. It’s chill, drinks are cheap, the music selection is amazing, and they let you request specific songs. They have a good dance floor space and most importantly, no one cares how good you are at dancing. They don’t have a cover, except for when they have a live band, usually on Tuesdays. This is pretty much a locals only spot. People tend to be extremely spontaneous and just ask you for a dance out of the blue. So if you’re feeling like giving your salsa moves a go, have a great time, and dance with locals this is definitely the place to go. The only downside though is that the area (Centro) can be a bit shady at night, so just follow the local’s advice and don’t give papaya. Our friends at Salsa Classes Medellin are a community of independent dance instructors, they can organize a night out dancing/ bar hopping with a professional salsa dancer. That’s really useful if you’re new in town or are coming by yourself. You can also take dance classes with them. Check out their facebook page for more info. Ana is a Universidad de Antioquia student and avid salsa dancer. When she’s not studying or out dancing she’s writing about her beautiful city, Medellin. I’d like to continue reading about your adventures and opinions.